"I'm convinced that all authentic beauty originates from the natural world," says Dean Entwistle, whose new work now hangs in thewhitegallery. "I try to reflect that in my paintings", he says. "That's what gives me a buzz." Originally an illustrator, Dean worked on projects as varied as designing postage stamps for the Republic of Ireland, illustrating travel guides and painting dolphins for the Sultan of Imman. He now paints full time, using only watercolours which he loves for their "subtle and responsive" nature. 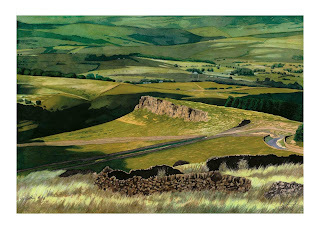 The two new pictures, 'Windgather Rocks' and 'Shuttlingsloe', are strong examples of Dean's use of colour and detail. Looking at the nightscape of Shuttlingsloe - with the moon and the snow - makes you want to whisper for fear of disturbing the peace. The energy of Windgather Rocks, on the other hand, makes you want to shout into the wind. Both pictures are available as framed limited edition prints from thewhitegallery. 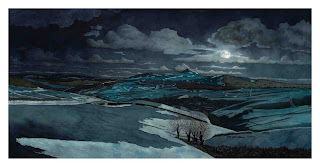 That painting of Shutlingsloe in the moonlight is magnificent. And very high on my wish list. I must come and see you!